Three Marian High School seniors recently signed national letters of intent to play their sports in college. 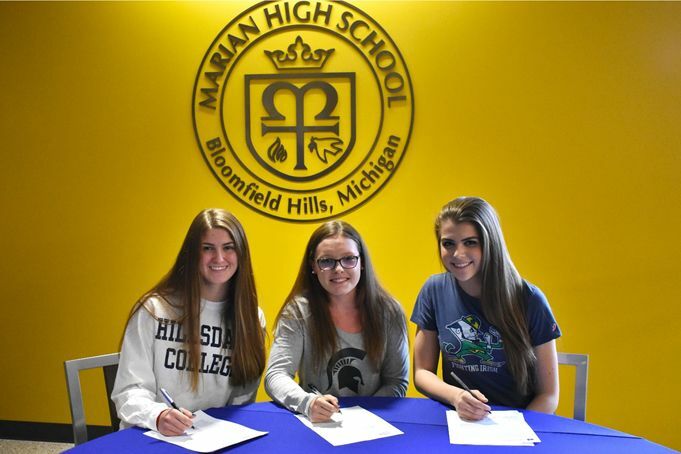 Lauren Biglin signed with Michigan State University to swim; Maggie DePorre will attend Hillsdale College to play volleyball, and Lauren Wenzel will be playing volleyball at University of Notre Dame. Lauren, the daughter of Kristen and Pete Biglin of Bloomfield Hills, will join the MSU swim team in freestyle next year while planning to study physical therapy. An All-State and All-American swimmer, Lauren is senior captain of the Marian swim and dive team and won the Most Valuable Player award in 2016. She also received the Work Ethic and Dedication Award from Motor City Aquatics. A member of Marian’s Ambassador Club and the National Honor Society, Lauren says “Marian gave me the tools and confidence to accomplish my dreams and goals both in the pool and in the classroom. Maggie, daughter of Janie and Paul DePorre of Troy, is looking forward to playing volleyball as a hitter and studying pre-law at Hillsdale next fall. Maggie, a member of Marian’s varsity soccer, track and field, and bowling teams, is also a member of student government. She was named All League and All-Region in Volleyball and All-Catholic, All-Region, All-County, and All-State in track. Lauren, daughter of Mary and George Wenzel of Bloomfield Hills, will be joining the volleyball team as a middle blocker at University of Notre Dame next fall where she plans to study business or pre-law. A Miss Volleyball candidate, Lauren is All-League, All-Region, All-Catholic, All-State, and JVA All-American. She plays club volleyball for a national elite team and has multiple Player of the Match awards. Lauren is a member of National Honor Society at Marian. She and her sister Lilly spearheaded a textbook donation drive for Hamtramck High School. She has also coached a youth soccer league. “Academically, I feel prepared to step into a college classroom with a solid foundation, Lauren said. “Great coaching helped me prepare for next year.